Fall Planting | Faddegon's Nursery, Inc.
Why is Fall Good for Planting? Is fall really good for planting? Fall is a great time to plant! It seems counterintuitive since we’re so used to gearing up for spring. We think about plants in the winter, get ready to plant containers garden beds, trees and shrubs as soon as we can. We’re totally gung ho and by September, we’re supposed to be done, aren’t we? We’re all used to seeing mums and kale plantings in the fall, but it isn’t just because they like the colder weather, it’s because they’re plants! The reasons for planting in the fall are simple and few. The Confusion: Plants are losing leaves and it seems like they’re getting ready for winter already. Doesn’t it seem like new plants would just grind to a halt? Actually, all of our plants are working on their root systems no matter what they look like above the ground. Getting ready for dormancy doesn’t mean everything is slow or stopped. Underground, roots are using the plant’s energy in preparation for cold weather. Not only that, but they’re developing more root health now than at any other time of the year. New plantings will do the same. Their energy will also go into growing roots. It’s a great time to transplant for the same reason. Soil Temperature. Roots love to grow in nice warm soil and that it is at the end of the summer. Trees, shrubs and perennials develop roots easily at this time of year. The soil is cooler in the spring, but plants have time on their side to get established and help them through the stress of planting. As a side note, Pruning is discouraged in late August and September. Pruning will spur the plant to put energy into growing shoots and leaves. Forcing that up top growth at this time of year will take away from root strength when the plant needs it most. Water Usage. Yes, you’ll still need to water carefully right up until the ground freezes, but fall rains may take some of the load off of you and the water doesn’t evaporate as quickly as it does in the warmer days of May and June so Mother Nature will be on your side in the fall. Fall Color. 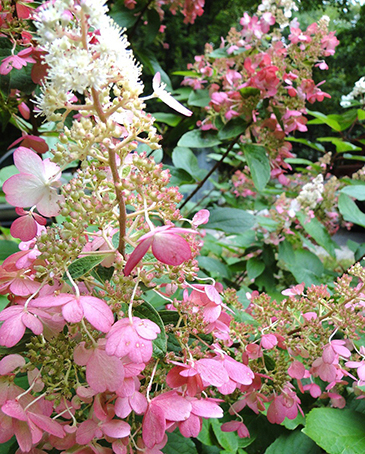 Often plants with fall blooms or color aren’t seen until the fall. Why hold onto that little scrap of paper with the name of the plant until next spring? See if the plant is available and give it a home. On Sale Now. Plants are generally on sale in September. This is a great opportunity to bring home some new members of your garden family. There are a lot of great selections! Personal Comfort. I don’t know about you, but I love gardening in the fall weather. I will do almost anything to get outdoors in September and October! Gardening is healthy! If you peruse the Harvard Health Publications, you’ll find that every time moderate activity is mentioned, gardening is on the list. Planting, raking and weeding all serve to keep your body happy, physically and emotionally. Don’t stop now!